Have you ever received a Christmas gift that is so good it defines the entire holiday? Nintendo, a BMX bike, the Technodrome playset - all gifts that shaped my merry season, raising the caliber for Christmas throughout the rest of my life. Can a gift be so bad it does the same? I think so. Ladies and gentlemen, I introduce you to the coal of Cowabunga Christmas, bootleg TMNT figures aka. Super Ninjas. You can put lipstick on a pig, but that doesn't make it pretty. The bootleg TMNT figures are not great. They are truly mutants. I can imagine a clueless aunt buying these for me as a kid, thinking she was going to make her little pizza-loving nephew happy with a TMNT surprise. But instead, I'd be confused and uncomfortable. These figures are really weird, looking more like bionic luchadores than Mutant Turtles. The included accessory doesn't help much either. It's not one of the Turtles signature weapons, but some sort of a pistol/dagger contraption. There's nothing ninja about it. I haven't opened these dopey dudes yet. That honor (and atrocity) seems like something worth saving for Christmas. While the rest of the world receives gifts ranging from new swanky clothes to the state-of-the-art electronics, I'll be opening this imported piece of trashy treasure. We all lead different lives. 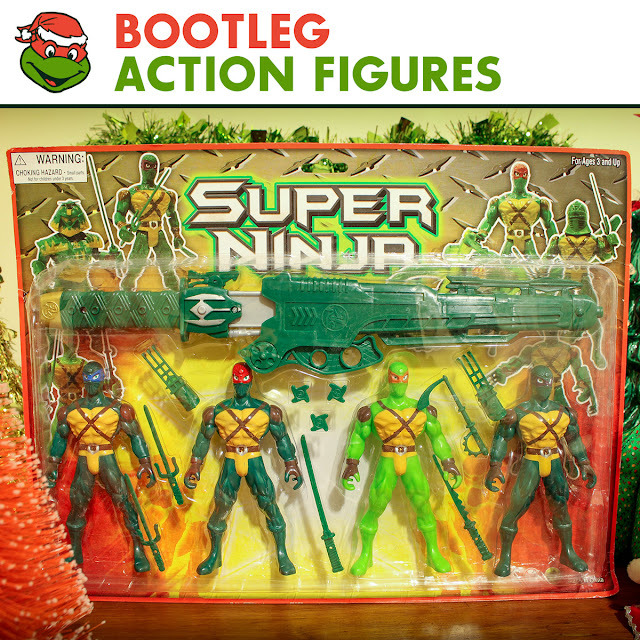 The bootleg TMNT figures make a terrible gift. Kids, adults, friends or enemies, no one deserves this package of putrid plastic this holiday season. Except maybe one person...ME! I love these ugly freaks. They're unlike anything in my TMNT collection and full of cowabunga crudeness. Of all my Christmas-themed collectibles, these dudes are definitely the big lump of awesome coal. Another big THANK YOU to my pal Chad, aka HorrorMovieBBQ, who played the role of Santa and brought the bootleg action figures to The Sewer Den. Check out his site and give the jolly man a follow on Twitter! Want more holiday hijinks? 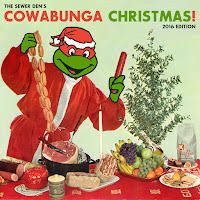 Check out more of The Sewer Den's Cowabunga Christmas! what in the world bro?